"There were things in the north before the land of Lomar—before mankind existed—and this was one of them. It took us all the way to Alaska, and up the Noatak from Fort Morton, but the thing was there as we knew it would be. Great Cyclopean ruins, acres of them. There was less left than we had hoped for, but after three million years what could one expect?" Pull your winter coat out of the closet. Pack your thermal underwear and your thickest mittens. 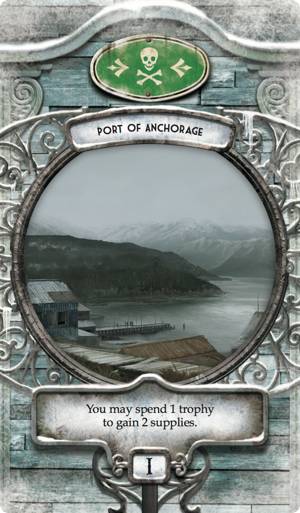 The bitter and unseasonable cold that has fozen the Miskatonic threatens to encompass the whole of the globe, and you are one of the very few people willing to accept that its origins lie with an unfathomable being stirring from eons of slumber somewhere in the Alaskan arctic. You know that this Ancient One wields power that defies mortal comprehension, and if your expedition team cannot prevent it from waking, the cold and hunger and madness that have begun to gnaw at civilized society will tear humanity to shreds. As you are among the very few who understand the dangers, you are the one who must brave the north. You must head into the frozen wilds. You must save humanity. 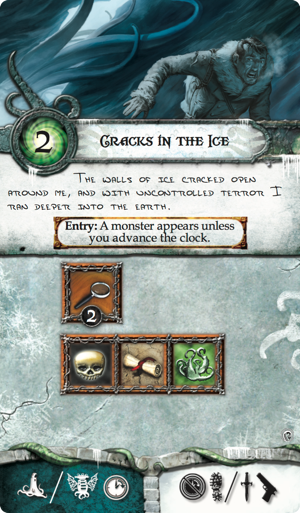 The Omens of Ice expansion for Elder Sign is now available! 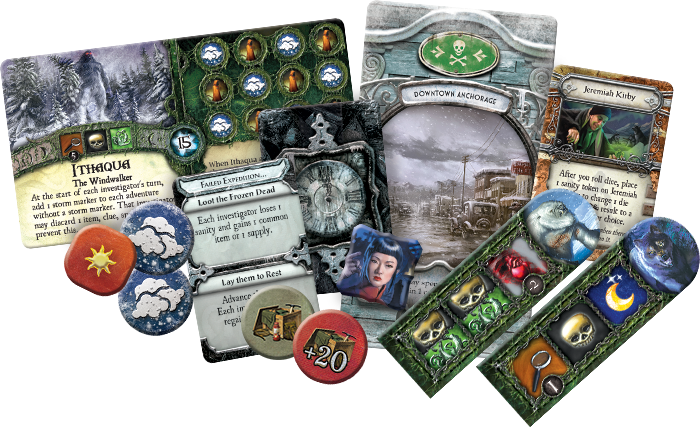 Featuring a deck of more than sixty Alaskan adventures, three new Ancient Ones, eight investigators, and thirty Alaskan mythos cards, Omens of Ice doesn't just expand your games of Elder Sign, it completely transforms them. You're no longer in the Museum. You're not even in Arkham. Your adventures take you deep into the frozen woods and rugged mountains of the Alaskan arctic. In Omens of Ice, your expedition must proceed through two stages, although it's up to you to determine when you move from the first stage to the second. So long as you stay in that first stage, you can search for clues, allies, and supplies amid the relatively safe towns of Fairbanks and Anchorage, as well as the neighboring Inuit communities. This time can be truly useful; you'll need those allies and supplies to help you survive your later challenges, and the clues you uncover may even lead you to one or more invaluable elder signs. However, you cannot thwart the Ancient One's rise until you press deep into the frozen wilds and the greater dangers of the expedition's second stage. In the second stage, you will face terrifying cold and hunger, raging storms, ravenous wolf packs, and creatures that defy description. 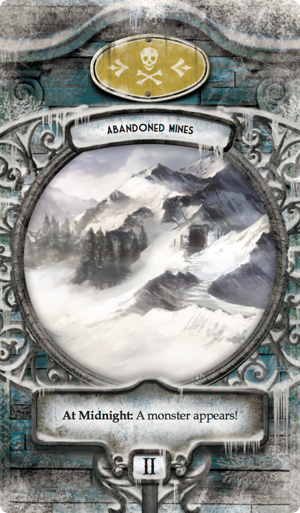 You'll need your supplies to survive, and if you're not well-stocked, you may succumb to frostbite and starvation well before you ever test your sanity against the Ancient One and the strange cultists and servitors that flock to it, even in the bitter arctic. You won't know what dangers an adventure may hold until you choose to explore it. Click on any of the cards above to uncover their challenges. The whole time, you'll face storms that unleash chaos upon your expedition. They may wreck your supplies or drain your stamina and sanity. They may even conceal monsters that set upon your group. The more of these storms you face, the less likely your chances of success become, and the longer your expedition drags on, the more storms you're bound to face. 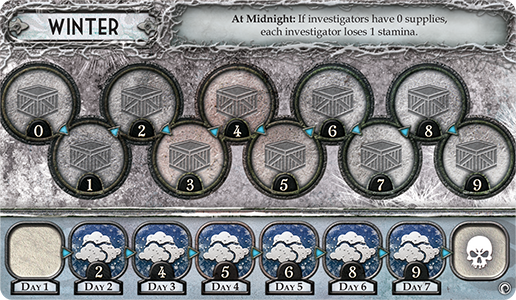 Throughout your games of Omens of Ice, you'll track your progress along a Track Card that adds more storms each new day, and provides a clear view of your supplies as they diminish. 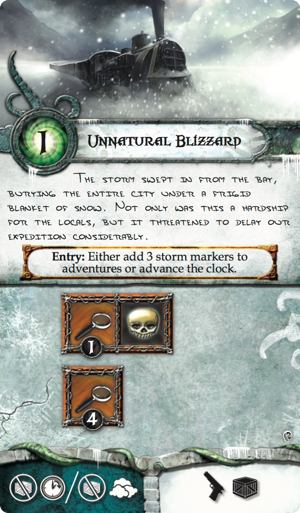 Altogether, this combination of weather, supplies, and Track Card ensures that each of your games of Omens of Ice are driven forward with a clear sense of urgency. Your journey is challenging in summer, but even more terrifying amid the cold and dark of winter. Click the Track Card above to see its winter side. 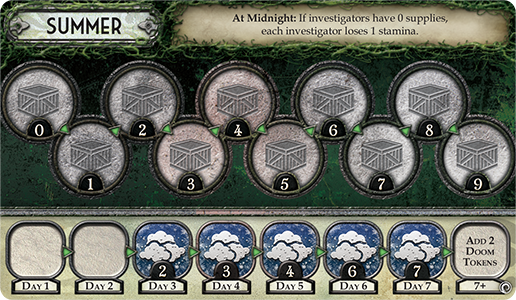 You can read more about the expedition's two-part structure, its storms, adventures, and Track Card from our previews and announcement article. The wind is howling, and blinding snow lashes down before you. Through the white, you see a silhouette. What is it? You draw near… and reveal your next encounter. Push fearlessly into the heart of the storm. 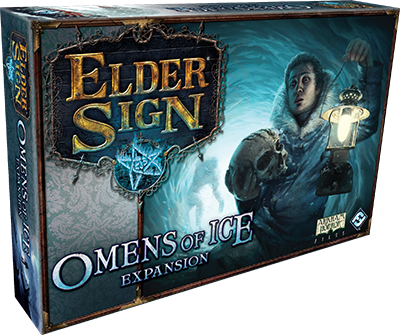 Head to your local retailer today to pick up your copy of the Omens of Ice expansion for Elder Sign!